The sun goddess Amaterasu, the divine ancestor of the Emperors of Japan, emerging from a cave. Via Wikimedia Commons. Below is an excerpt from 1946, by Victor Sebestyen, as recommended by Longreads contributing editor Dana Snitzky. Hanging the Emperor would be comparable to the crucifixion of Christ. Prince Naruhiko Higashikuni was the first member of the Japanese imperial family to break ranks and say it publicly. On 27 February 1946 he told a journalist from the New York Times that Emperor Hirohito should abdicate in favour of his son and a regent be nominated until Crown Prince Akihito, then aged twelve, came of age. Higashikuni, the Emperor’s uncle by marriage, was one of the few members of Japan’s ruling circle in the 1930s to have opposed war in Asia and to have warned against embarking on a route bound to result in conflict with the United States. After Pearl Harbor he had continually sought ways to bring about peace. Following Japan’s surrender in August 1945, he became Prime Minister, charged with overseeing the cessation of hostilities and reassuring the people that the Japanese empire was secure, despite the defeat. After two months he retired voluntarily, but he remained one of the most influential members of the government. Now he admitted that in Tokyo court circles the idea of abdication had been discussed for months; just a few days earlier he had told the Emperor in a private audience that he should stand down. He had said the same thing at a Cabinet meeting. Hirohito, he declared, bore ‘moral responsibility’ for the nation’s defeat, ‘to the dead and to his bereaved subjects’. But the most powerful man in the country had decided against abdication. General Douglas MacArthur, the proconsul in charge of America’s occupation of Japan, was insistent on Hirohito staying on the throne—and whatever MacArthur wanted in postwar Japan he got. America would remake Japan from the top down and turn it from semi-feudal despotism into a model twentieth-century democracy rooted in Western precepts of freedom. The Americans would impose democracy by fiat on Japan, whether the Japanese wanted and liked it or not, but they would do so using imperial institutions, including the existing civil service. They adopted as their principal ally and functionary in the task an Emperor who just weeks earlier had been regarded by his people, and by himself, as a descendant of the gods. Despite such obvious ironies, the creation of the new Japan was a remarkable achievement—practical, efficient, bloodless —and of lasting importance in re-ordering not just Japan but, by example, much of the Asian continent. MacArthur and Hirohito. Via Wikimedia Commons. At the beginning of 1946 neither princes nor poets would have dared to question Emperor Hirohito’s right to rule, despite the humiliation of total defeat. But early in the New Year, the Emperor issued a statement proclaiming himself human. It was the first stage of a process that turned Hirohito from an absolute ruler, literally worshipped by his people, into a constitutional monarch. The statement, or ‘Declaration of Humanity’, was not written by the Emperor, or indeed anyone at Hirohito’s court. It was drafted by a mid-level officer of the American Occupation authority. MacArthur—referred to by everyone in Japan, including himself, as SCAP (Supreme Commander for the Allied Powers)—wanted the Emperor to make a public relations gesture that would both help to keep him on the throne and avoid a war crimes trial. The statement was designed to be heard in Washington DC and London as loudly as it was in Kyoto and Okinawa. Its author, Lieutenant-Colonel Harold Henderson, an advisor to SCAP’s Education Department, had been wrestling with the wording for some days. By his own account, Henderson finished the draft in his lunch hour, lying on a bed at the Daichi Hotel in central Tokyo, where many of the senior American occupation soldiers were billeted, ‘imagining what it would be like to be the Emperor of Japan.’ He came up with a simple two-paragraph statement which had profound implications. The Emperor said he ‘looked forward to a new world with new ideals, with humanity above nationalism as the great God. The ties between us and the nation do not depend only on myths and legends . . . and do not depend at all upon the mistaken idea that the Japanese are of divine descent, superior to other peoples and destined to rule them. They are the bond of trust, of affection, forged by centuries of devotion and love.’ The statement refrained from saying in plain language that Hirohito was a man—by ‘a subtle use of esoteric language’ the Emperor had only to descend ‘part way from heaven’, as the highly conservative constitutional expert Joji Matsumoto claimed. But it identified the Emperor with less archaic notions of sovereignty, which were new to Japan—and to Hirohito. Until the unconditional surrender, days after the bombs fell on Hiroshima and Nagasaki, he had shown little interest in democracy or in the people’s will. But his advisors and SCAP warned him that he needed to burnish his image as a peace-loving, European-style figurehead who had been betrayed by the ruthless military men around him if he wanted to preserve the monarchy, to remain on the throne—and to stay alive. Many influential figures in Washington, including most of the senior military brass, wanted the Emperor deposed, tried as a war criminal and executed. 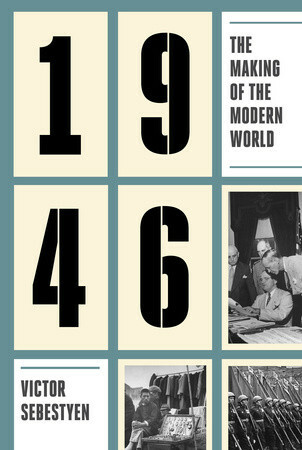 The British, Russians, Australians, Koreans and Chinese all pressed President Truman to start proceedings against him. Neither Attlee nor Stalin could understand what the Americans were waiting for. 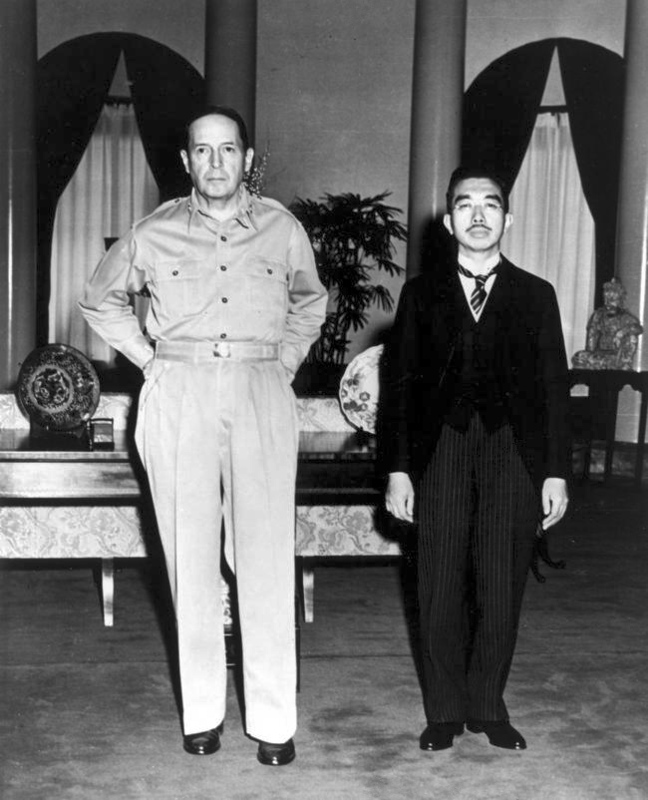 A Senate resolution and the Joint Chiefs of Staff instructed MacArthur to ‘proceed immediately to assemble all available evidence of Hirohito’s participation in and responsibility for Japanese violations of international law.’ But MacArthur hesitated. He was convinced that the monarchy, with Hirohito continuing as Emperor, was vital for the stability of Japan and to bringing about the revolutionary changes to the country he was planning. Hindsight suggests he was probably right. MacArthur knew very little about Japanese history or culture, but a close advisor on his staff, and a personal friend, Brigadier-General Bonner Fellers, knew a great deal. Fellers had studied Japanese and visited Japan often between the early 1920s and the late 1930s. His cousin Gwen, to whom he was very close, was married to the Japanese diplomat Terasaki Hidenari, who had been posted to Washington for many years. Fellers wrote a series of intelligently argued briefing papers which seemed to MacArthur much more informative than the superficial material he was receiving from home. An absolute and unconditional defeat of Japan is the essential ingredient for a lasting peace in the Orient. Only through complete military disaster and the resulting chaos can the Japanese people be disillusioned from their fanatical indoctrination that they are the superior people, destined to be overlords in Asia. Only stinging defeat and colossal losses will prove to the people that the military machine is not invincible and that their fanatical leadership has taken them the way to disaster . . . There must be no weakness in the peace terms. However, to dethrone or hang the Emperor would cause tremendous and violent reaction from all Japanese . . . Hanging the Emperor would be comparable to the crucifixion of Christ to us. All would fight and die like ants. The position of the militarists would be strengthened immeasurably. An independent Japanese army responsible only to the Emperor is a permanent menace to peace. But the mystic hold the Emperor has on the people . . . properly directed need not be dangerous. The Emperor can be made a force for good and peace provided the military clique [around him] . . . is destroyed. MacArthur was convinced, and set about persuading Washington to support the monarchy in general and Hirohito in particular. At the end of February 1946 he cabled Eisenhower, saying that he had investigated the Emperor’s role over the past decade and that no evidence had come to light linking him to war crimes—a disingenuous claim as nobody had looked very hard. Indeed, they had quite deliberately not tried to find documentary proof or a paper trail of any kind. Japan would experience a tremendous convulsion . . . it would initiate a vendetta for revenge . . . whose cycle may not be complete for centuries . . . Destroy him and the nation will disintegrate. Civilised practices will largely cease and a condition of underground chaos and disorder amounting to guerrilla war . . . will result. All hope of introducing modern democratic methods would disappear and when military control finally ceased, some form of intense regimentation, probably along communistic lines, would arise. A minimum of a million troops would be required, which would have to be maintained for an indefinite number of years. A complete civil service might have to be recruited, running into several hundred thousand. Truman reluctantly agreed that keeping Hirohito and the monarchy was the lesser of two evils. This was when the essential myth of modern Japan—nurtured over many years to come—was born. Hirohito had to be presented as a man of peace, hoodwinked by others—a ceremonial figure who had no choice but to go along with everything the soldiers around him wanted, from the invasion of China and the ambitious plans to conquer a vast Asian empire, to war with America and the British. There is, however, a mass of evidence that categorically proves the opposite: that he knew of and approved the war aims, including the timing of the Pearl Harbor attack; that he was a more than willing participant, and that he did little to halt the atrocities committed by his troops. Hirohito, then in his forties, was an intelligent, extremely educated man, but he was also inflexible and unimaginative. He was not usually reflective nor, as those who knew him admitted, a deep thinker. He had considered abdication in order to devote his time to the real passion of his life, marine biology. But on the advice of his Cabinet he rejected the idea on the grounds that it would ‘encourage republicanism.’ He also realised that if he were no longer Emperor and thus useful to the Americans, it would be much easier for them to charge him with war crimes. The ultimate pragmatist, Hirohito never acknowledged that his actions had been in any way criminal, nor that the war and its conduct had been morally wrong, only that they had been a mistake. In a private letter to his son, the Crown Prince—sent a few months after the war, when the future Emperor Akihito was twelve, but which did not surface until the 1980s—Hirohito showed little insight, let alone remorse. He blamed the incompetence of his generals and made no mention of democracy or the pursuit of peace. Instead, he told his son, ‘our people lost the war because they took the US and Britain too lightly.’ The military had failed to grasp the big picture. ‘They knew how to advance but not how to retreat . . . had the war continued [we] could not have protected the three holy regalia 1 and the people would have to have been killed.’ It was a chilling admission from a once godlike ruler who was now revealed as all too human. We were not invincible, as we had been told by our superiors. The Emperor’s Holy War had cost the lives of at least 2.7 million of his subjects. In a decade and a half of conflict—Japan had first invaded China in 1931, annexing part of Manchuria, and then again six years later—1.74 million soldiers were killed in battlefields stretching from the Great Wall of China to the northern tip of Australia. In the two and a half years after the war reached the home islands almost a million people died in the carpet-bombing of Japanese cities and prime agricultural areas. The country was devastated—‘cowed and trembling before . . . [a] terrible retribution’ thundered MacArthur, who liked grandiloquent phrases. The destruction of Japan was significantly greater than the Allies had inflicted on Germany, even before taking account of the effects of radiation from the two atomic bombs that ended the war. Around two-thirds of all homes in Tokyo were destroyed, 57 per cent of homes in Osaka and 89 per cent in Nagoya. As people fled to the countryside, many cities became ghost towns. 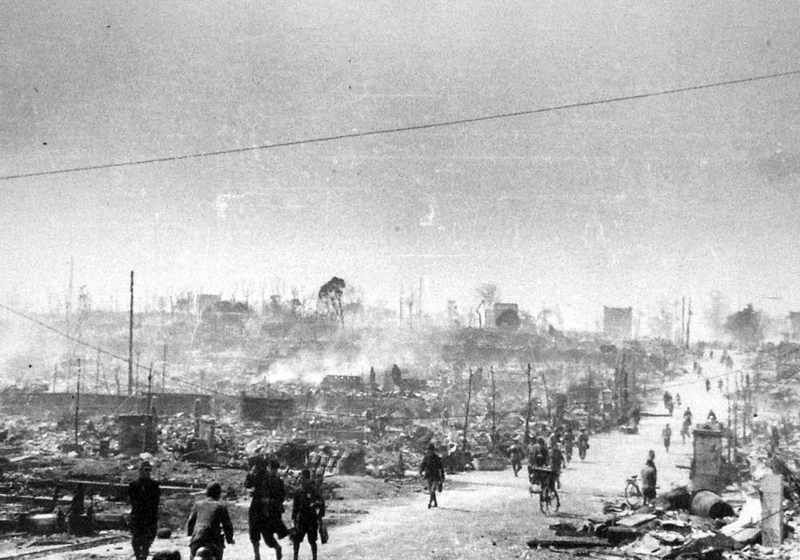 Tokyo after the Allied firebombing of March 1945. Via Wikimedia Commons. The Japanese military had deliberately underestimated the damage in case it encouraged defeatism. But at the end of January 1946 a US Strategic Bombing Survey conducted for SCAP showed that, at the time of Japan’s surrender, its capacity for continuing the war had been exaggerated. Harry Truman’s personal envoy, Edwin Locke Jr, came to the same conclusion a few months after VJ Day. ‘The American officers now in Tokyo are amazed that . . . the resistance continued for as long as it did,’ he reported to the President. ‘The entire economic structure of Japan’s greatest cities has been wrecked . . . Five million of Tokyo’s seven million population . . . left the city.’ Around the same time, a team of American economists calculated that Japan had lost more than a third of its total wealth and around half its potential income, not including the assets from its hugely profitable Asian empire. Japan was dependent on shipping but had lost more than 80 percent of its entire merchant fleet from Allied attacks in the Pacific and the home islands. Amidst the rubble of the cities, one of the saddest sights was that of orphaned children with white boxes hanging around their necks. The boxes contained the ashes of their relatives. In some cities, more than a quarter of the population was homeless—with a mass influx returning home from the front. More than five million Japanese were repatriated in the eighteen months after the war. Around 80 percent were soldiers and the rest were colonists and their families from the empire Japan had conquered but had now lost. They were seldom welcomed back with open arms. Soldiers, in particular, were widely despised—and this in a country where propaganda, and long tradition, had conditioned its people to hold officers and men from the Imperial Army as the fount of all honour. ‘We were not invincible, as we had been told by our superiors,’ one officer recalled wearily, many years later. ‘The big shock was coming home and being shunned. People did not look us in the face.’ Army and people together were not ‘a hundred million hearts beating as one’, as the military mantra went. The people now regarded soldiers not as returning heroes but as discredited failures, and treated them as pariahs. But it was not only that the military had failed lamentably in its mission and left the country starving and ruined: since the defeat, the public had also been inundated with information about the atrocities Japanese soldiers had committed in China, the Philippines, Korea, Indonesia, and South-East Asia. Japan had been dishonoured in the eyes of its own people, for which the Japanese blamed their own soldiers. 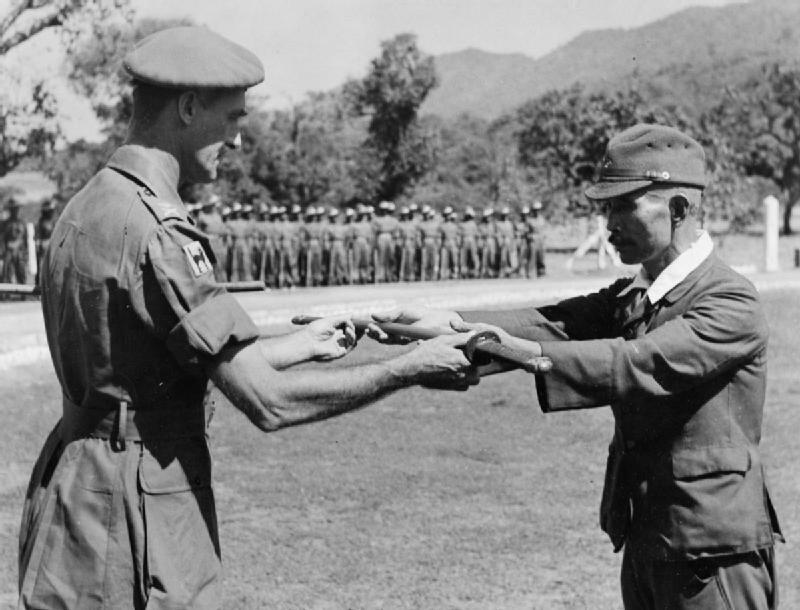 A Japanese general surrenders his sword. Via Wikimedia Commons. But in the immediate aftermath of defeat questions of honour took second place. For at least the next two years food remained the biggest issue for most Japanese. Much of Japan had gone hungry long before the surrender. Shortages had been acute since the fortunes of war had turned in favour of the Western Allies and by the end of 1944 the majority of Japanese were malnourished. South Korea and Formosa (Taiwan) had been colonies since before the First World War and had produced large amounts of food for the home market2. But the sinking of Japanese ships in the Pacific meant that these supplies were not getting through. American bombing of the cities had also disrupted food distribution, and 1945 saw the worst harvest since 1910. At the end of autumn 1945 the country was almost entirely out of rice. Thousands had starved to death and officials warned that ten million people now faced imminent starvation. They were exaggerating, but their panic prompted swift action from the occupying army. Under the responsibility of victory the Japanese are now our prisoners, no less than did the starving men of Bataan become their prisoners when the peninsula fell3. As a consequence of the ill treatment, including the starvation of Allied prisoners in Japanese hands, we have tried . . . Japanese officers upon proof of responsibility. Can we justify such punitive action if we ourselves in reversed circumstances, but with hostilities at an end, fail to provide the food for sustaining life among the Japanese people over whom we stand guard? This impressed the Japanese immensely and ‘kindled a light of hope in hearts that despaired’, according to the otherwise anti-American historian Yamahoka Akira. The food imports did more than anything else to make the Japanese accept defeat and occupation. The supplies were basic Western foodstuffs: wheat, corn, flour, sugar, dried milk and tinned corned beef. They were not part of the traditional Japanese diet, but kept people alive, even if ‘hunger was a constant companion’. Instead of rice, the new staples were a thin, watery gruel and a form of steamed stale bread usually fed to cattle. Necessity forced people to experiment. By the middle of 1946 newspaper advice columns were headlined ‘Let’s Catch Grasshoppers’, and ‘How to Eat Acorns’. But occasionally letters were published from middle class ladies, who complained that American beans caused embarrassing levels of flatulence – ‘the new rations makes one so ill mannered’, said one. Mac tells God right off. 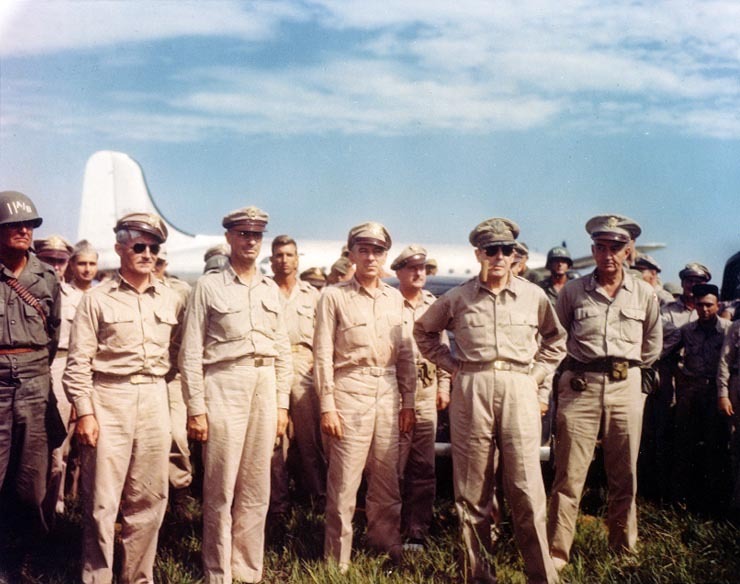 MacArthur arrives at Atsugi. Via Wikimedia Commons. MacArthur’s men loved him, but throughout his career he was almost universally hated by officers of similar rank and above, who observed his vaunting ambition at first hand. Considering how many powerful enemies he made in the army and politics, it is amazing that MacArthur rose to the heights he did. He had been decorated many times for acts of conspicuous bravery on the battlefields of France during the First World War. But though his commanding officer, the venerable General John Pershing, pinned the medals on him, he was also writing home that he loathed MacArthur, whom he said was no better than ‘above average’ in military efficiency and ranked him thirty-eighth out of forty-five in talent among US brigadier generals. ‘He has an exalted opinion of himself,’ wrote Pershing, a feeling shared by scores of MacArthur’s officers. The public adored a hero, though, and when he married the fabulously rich, if flighty, J.P. Morgan banking heiress Louise Cromwell Brooks in the 1920s, one newspaper headlined the match ‘Mars Marries Millions’. His stock rose even higher among the people, if not among his fellow officers, when a comment the bride made to her brother – ‘He may be a general in the army, but he’s a buck private in the boudoir’ – found its way into the gossip columns. Roosevelt, too, had always disliked MacArthur personally, but he admired him as a leader of men and realised his importance as a war hero. There had always been mutual distrust—MacArthur made no attempt to hide his right-wing Republican views—but it flared into the open in 1933. It was at the lowest point in the Depression and Roosevelt, who had been President for just a few months, wanted to cut the army budget and redirect federal spending towards domestic New Deal programmes. At a meeting of the Joint Chiefs of Staff, MacArthur stormed into a rage as the other starred generals looked on. ‘When we lose the next war and an American boy, lying in the mud with a bayonet through his belly and an enemy foot on his dying throat, spits out his final curse, I want the name not to be MacArthur, but Roosevelt.’ Roosevelt was indignant. ‘You must not talk like that to the President,’ he snapped back. Yet Truman gave him enormous power, and virtual independence in wielding it. His standing orders stated: ‘You will exercise our authority as you deem proper to carry out your mission. Our relations with Japan do not rest on a contractual basis, but on unconditional surrender. Your authority is supreme.’ For six years MacArthur had more power over 70 million Japanese than Truman possessed in the United States over 200 million Americans. Ambassador William Sebald might have been the State Department’s man on the spot in Tokyo, but he had to ask MacArthur’s permission before seeking an audience with the Emperor or any senior Japanese government officials. ‘Never before in the history of the US had such enormous and absolute power been placed in the hands of a single individual,’ Sebald said after his tour of duty in Tokyo was over. The Supreme Commander possessed the messianic zeal for the challenge and believed instinctively, as did European imperialists of old, in the superiority of the white man and in the purity of his civilising mission. The Occupation, which lasted six years and eight months—twice as long as the war between the US and Japan—was entirely American-run. Nobody else was allowed any say—and certainly not the Koreans, the Chinese, the Vietnamese, or the Filipinos, the conquered peoples who had recently suffered far more at the hands of the Japanese than had America. Other Asian countries’ opinions were never sought. The Americans seldom liked to hear it, but race played a profoundly important role in the Occupation. MacArthur himself barely saw any of the Japanese over whom he ruled. He never socialised with them—off-duty his relaxation time consisted chiefly of watching cowboy movies with his cronies and his second wife, Jean, a loyal, rather matronly figure, with whom he lived happily until he died. According to his private secretary, Faubion Bowers, ‘only sixteen Japanese ever spoke to him more than twice and none of those were under the rank, say, of Premier, Chief Justice or President of the largest university.’ Yet he grew immensely popular. MacArthur’s own simple reasoning was that ‘the oriental mind adulates a winner’. An equally straightforward explanation is that the Japanese were familiar with authoritarian rulers who regarded themselves as godlike. Nearly half a million people wrote to him and he kept thousands of their letters meticulously filed. Most were filled with cringe-making gush. He was often called ‘Japan’s living saviour’. One correspondent said, ‘When I think of the generous measures your Excellency has taken instead of exacting vengeance I am struck with reverent awe as if I was in the presence of a God.’ And an elderly man told MacArthur that each morning he worshipped the SCAP’s picture as he used to do with the Emperor’s. He was sent huge numbers of gifts—from silk kimonos to ceremonial tea pots to confectionery. One of MacArthur’s big weaknesses was that he surrounded himself with yes-men, cronies who never challenged his assumptions.‘His egotism demanded obedience not only to his orders but to his ideas and person as well,’ said the playwright, journalist and Ambassador to Italy Clare Boothe Luce, who had known him well for decades and, in many ways, admired him greatly. ‘He . . . relished idolatry and surrounded himself with sycophants.’ There were around one and a half thousand SCAP officials under him in mid-1946, a figure which doubled the following year. Many were idealistic and full of reforming zeal. They believed that they were building a new society in Japan, a society that would bring peace and stability. But many others were too busy having a good time. In Japan, as in Germany, Washington at first decreed that there should be no fraternisation between Occupation forces and the Japanese. But there were nearly half a million American troops in Japan throughout most of 1946 and the regulations were flouted so often they became pointless and unenforceable. MacArthur reversed the orders. ‘They keep trying to get me to stop all this Madam Butterflying around,’ he told one of his aides. ‘I won’t do it. I wouldn’t issue a non-fraternization order for all the tea in China.’ Historically, the home islands had been so cut off that the GIs were the first foreigners most Japanese encountered. And the Americans knew next to nothing about the Japanese. It was an entirely unequal relationship, victor and vanquished, powerful and powerless. Most rank-and-file GIs had little or no contact with the Japanese people. The only women they met were prostitutes. Prostitution, especially the idea of American soldiers ‘defiling’ Japanese womanhood, presented a problem to the Japanese authorities, who had their own ideas about the ‘needs’ of the American military. They assumed the US troops would behave as their own soldiers had done, taking ‘comfort women’ as trophies of war from the territories they had colonised. As a result, they employed ‘comfort women’ for the GIs, advertising in the press for volunteers. Hundreds of brothels were established to service the troops, segregated by rank and, of course, by race, with entirely separate facilities for black GIs. Naturally, most of the women who volunteered did so out of desperate financial necessity, but some turned out to be from reasonably comfortable middle-class families and were acting out of a patriotic desire, as the Government put it, ‘to perform the great task of defending Japanese women’. 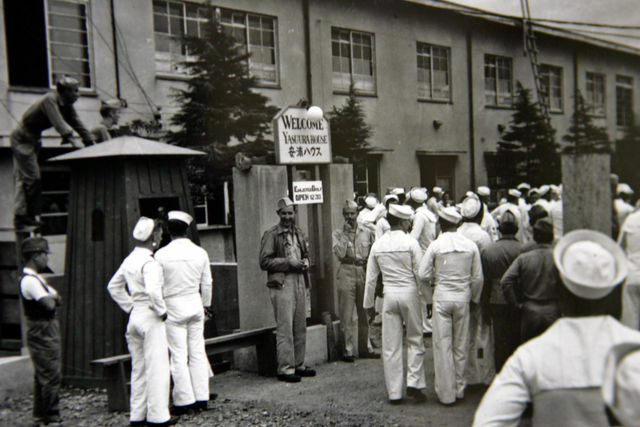 A brothel for American soldiers in postwar Japan. Via Wikimedia Commons. Although our family has endured for three thousand years, unchanging as the mountains and valleys and the rivers and grasses, since the great rending of August 1945, which marked the end of an era, we have been wracked with infinite, piercing grief and endless sorrow and we are about to sink to the bottom of parlous, boundless desperation . . . The time has come, an order has been given, and by virtue of our realm of business we have been assigned the difficult task of comforting the Occupation army as party of the urgent national facility of post-war management. This order is heavy and immense, and success will be very difficult. We absolutely are not flattering the Occupation force. We are not compromising our integrity, or selling our soul. We are paying an inescapable courtesy and serving to fulfil one part of our obligations and to contribute to the security of our society. We dare say it loudly: we are but offering ourselves for the defence of the national polity. In other words, everyone had to make sacrifices. Despite the fine words about patriotism, crime syndicates quickly took control of most of the ‘official’ brothels and the women working in them were effectively bought and sold. In the spring of 1946, by which point it was estimated that a quarter of the GIs who used them were infected with venereal disease, MacArthur closed the brothels down. Reminiscent of the latter days of the court of the Empress Catherine. The scope and ambition of the American project in Japan were astonishing. As one historian put it, America ‘set about doing what no other Occupation force had done before: remaking the political, social, cultural and economic fabric of a defeated nation and in the process changing the very way of thinking of its people.’ On the whole the Japanese would accept the Occupation, and willingly import the ideals of democracy and the free market. But there would be plenty of resentment at their liberators’ arrogance and institutionalised racism. The paradox was that for the six years of Occupation it would be the anti-imperialist US that took up the ‘white man’s burden’. And Lodges talk only to God. From the Book 1946 by Victor Sebestyen. Copyright © 2014 by Victor Sebestyen. Published by arrangement with Pantheon Books, an imprint of The Knopf Doubleday Publishing Group, a division of Penguin Random House LLC.